I wrote this about two months ago. This is the pic that I took with MG Ak. I printed a copy for him and one extra so he could personalize it for me. Pretty cool. 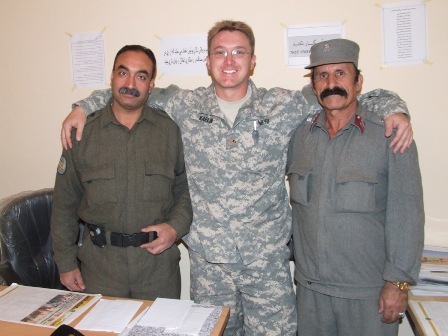 The two Colonels in the pic are the temporary Regional Logistics Technical Officer (right) and the Regional G3 (left). We had to go in and talk to them about laying on classes for the next few months and getting student names and such. When I walked into their office, I sat my bag on the floor and then just kind of dropped my hat and let it lay at my feet. The G3 Colonel looked at it but I paid scant attention to this minor detail. A hat is a hat and I’m not one to make a fuss over this uniform. I don’t really care to wear it so I don’t really care how it looks or if my hat gets a little dusty. I guess the Afghans aren’t used to Americans with this attitude. We start our meeting and I try to let Ron get things going but lose patience and keep jumping into the conversation–as usual. I’m not very patient and like to get to the point. The meat of the situation. Patience has never been my strong suit. But directness has and it usually serves me well. We get our message across. We chit chat a bit with the Colonels and smile and at the end of the meeting, I let off a big HOOAH! which always seems to bring a laugh from the Afghans. After that, it’s time for the Kodak moment. I always take a pic with the folks that I meet. It seems to help create a bond. Afghans love pictures. After the pics, the Colonels asks Farhad if I am indeed American. They seem to think that I am a bit different than most Americans. Farhad tells them; “No, he is American.” But they insist that I am different because I carry myself differently or some such thing. I am “not too polite but not too corrupt.” (Farhad doesn’t tell me this until later.) I just smile. Shake hands with them. Say my “Khoda Hafez'” to them. Farhad and I take our leave and walk down the hall to see if we can get in to talk with MG Akrummuddin. Afghans love to take pictures and they love it even more if you print the pics off and take them a set as a “gift.” I took several pics with MG Akrummuddin and his PSD last time I visited the Regional Command Center. In preparation for our return visit, I printed off pics of MG Akrummuddin and his security detail to hand out. Helps to smooth the way when trying to get these guys to buy into your program. Or such is my experience. To get in to visit with Akrummuddin, one must first request an audience with his Security Supervisor. This guy is like a glorified secretary with guns. Lots of guns. 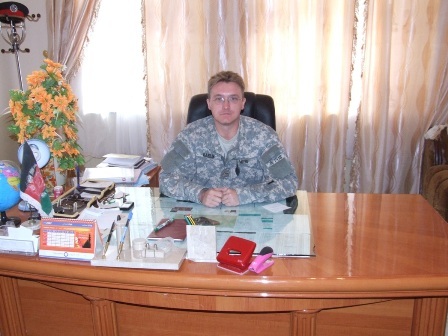 You walk into his office and ask for an audience with the General. If he’s available, you wait a few minutes more and the adjoining door is opened for you to step through and into the Generals office. Usually, he has two or three other guests and you have to wait your turn. So he greets you by coming around from his desk, shaking your hand and pointing you to a seat. While you are waiting to push your point or sell your idea or product or whatever the purpose of your visit, the General’s aide brings you chai and various nuts in a tray–pistachios and a few other types. (I should have taken a pic of this tray). On this day, a couple of Afghani contractors were trying to obtain fuel for some sort of operation that sends them far up into the Band-e Bayan range of the Hindu Kush Mountains to Chagcharan. They argued back and forth. 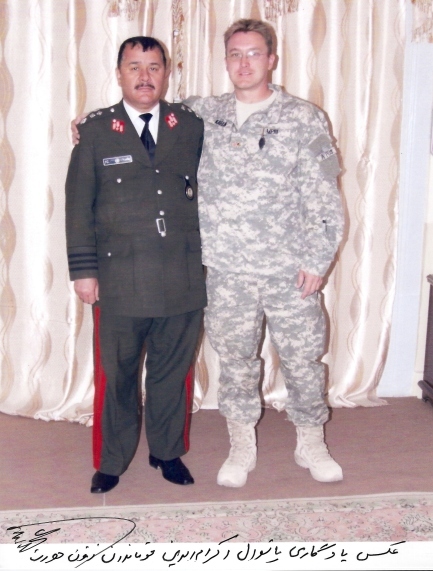 Apparently the contractors wanted 180 gallons of fuel but GEN Akrummuddin was only willing to give them 150 gallons. So they kept pushing a piece of paper back and forth across his desk. I assume this paper was the fuel grant. The contractors wanted a larger grant. MG Ak would not relent and up the fuel amount for them. They left rather disappointed. Initially, my intent was simply to give MG Akrummuddin his picture and be off. I figured that it really wouldn’t be that big a deal. He would say thanks and throw the picture in a drawer and forget about it. No big deal. But when I handed him the picture, he looks at it and asks what happened to his legs. “Why did you cut off my legs?” I replied that I didn’t cut off his legs. That’s how the picture was taken. Then I laughed and told him that it was Farhad’s fault. That made Farhad nervous. Akrummuddin says [to me]; “Why did you do this? You are not Afghan. Afghans take crazy pictures like this.” Then he tells Farhad that as a penalty for cutting off his legs we must wait so that we can take the picture again. And this time, if we cut off his legs, he will cut off Farhads [or mine] for real. I laugh. I don’t know if he is serious or not. MG Ak seats us next to his desk. We wait around 15 or 20 minutes for him to finish his business with the contractors and an Italian Caribinieri Police Mentor. 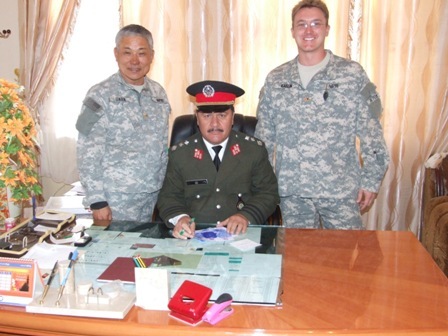 After they depart, MG Ak leads me over to the curtain where we take the picture and Ron and I take turns posing with the General. I ask if it’s ok if I put my arm around the Generals shoulder like we are good buddies. Farhad translates and MG Ak tells me it’s cool. I accidentally put my hand on his shoulder board covering his rank and he tells me that we can not cover up the rank. It’s important to see this. We cut up and carry on like old buddies. It was pretty comical. We’re in his office laughing loudly and talking about anything and mostly nothing. We didn’t really discuss any business. He asks us to take a picture of him sitting at his desk. Then he tells us to stand next to him and take a picture with him at his desk. On a whim, I ask if I can sit at his desk and take a picture. He laughs and tells me to have a seat. It goes on like this for a good 30 minutes or so it seems. At the end, MG Ak tells us through Farhad that if we need anything to come to him and that his office is always open to us. Once we are outside the Generals office, Farhad looks a little faint. He tells me; “Dave! No one does this.” He is laughing and looking at me like I’m crazy. “Dave, no one does this. But like that Colonel said. ‘You look different and act different.’ You are one of them–not too polite and not too corrupt.” I just laugh and tell Farhad that it’s because I am crazy. It’s just another day for me. This is my life and I enjoy days like these.